This time of year I can’t get enough of all the fresh fruits and veg at the farmers markets, especially knowing that cooler months will soon be here and there won’t be a farm fresh tomato to be had. So how do I prolong my enjoyment? By preserving what the market has to offer now. From berry and peach jams, to green tomato chutney, to pickling just about everything, from beans to brussels sprouts to beets. Might I add that the beans and sprouts are perfect garnishes for a bloody mary. Oh and let me not forget okra, another terrific bloody mary accoutrement. And yes, I am not kidding, easy. To think, years ago this was a way of life….but then again so was beheading and plucking your own chicken. Given those options I am thinking, let’s pickle. Now don’t feel you have to buy a whole bushel of produce in order to pickle, start with small batches to test your pickling prowess, say ten cucumbers instead of ten pounds. 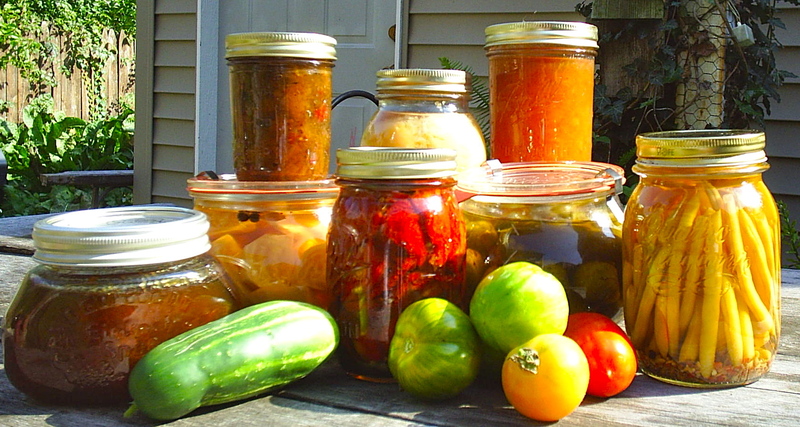 You will need a pickling solution, typically a vinegar or brine or a combination of both. Any type of vinegar can be used from white and cider to balsamic, and just about any type of spice can be used. You say you want a sweet pickle? Sugar then becomes part of the pickling solution. Here is an easy and fast recipe for garlicky dill pickles. And to my friend (or any of you) with the beets? Let me know if you need that pickled beet recipe. Sterilize 4 clean pint sized canning jars, and lids, either in a bath of boiling water or in the dishwasher. Trim the ends of each cucumber. Combine the vinegar, water and salt in a saucepan and bring to a boil. Place one clove of garlic, one teaspoon of dil seed and a pinch of chili flakes in each jar. Pack in cucumbers into each jar. Pour boiling pickling solution over the cucumbers to within a 1/2 inch of the jar rim. Seal the jars with lids and then place in a boiling water bath for 10 minutes. Remove from the bath. When you hear the lid ‘pop’ you know that the jar is sealed and ready to store. This entry was posted in To Market with Mo and tagged Andersonville Farmers Market, beets, Chicago Area farmers marekts, Chicago Farmer's Markets, cucumbers, Evanston Farmer's Market, Farmers Markets, fresh organic, Glenwood Sunday Market, Green City Market, Henry's Farm, moira's blog, pickles, pickling, to market with mo. Bookmark the permalink.